With close to half a million K-12 international standards in the EdGate repository, 2018 has been the year of international standards for EdGate. We’ve been delighted to hear from educators and publishers from the UK, India, Australia and Senegal who are looking for a way to cost-effectively align their content to international standards in order to market their products globally. Using EdGate's time-tested and cost-effective taxonomical approach, curriculum publishers are turning to EdGate to apply taxonomic terms (concepts) to content in order to align curriculum to multiple sets of standards in one fell swoop. Note that the Cambridge Standards (see article below) are now being used by 10,000+ schools worldwide. Standards for Australia (ACARA), India (CBSE), United Arab Emirates and Canada are also frequently requested. To see a full list of international standards, please visit our interactive standards map pages. Don't see a set of international standards you are looking for? No problem-contact us so we can start researching how we can add them to our growing library of standards. As always, EdGate is your source for staying current with new developments in education and the impact of educational standards. From Khan Academy to YouTube, contemporary education has benefitted greatly from the vast amount of free and accessible film resources for classroom use. Indeed, from teaching concepts to building context, the current EdTech landscape gives teachers a nearly infinite supply of audiovisual resources to choose from. But for many publishers of film content, the resources to make their products classroom-ready are not attainable. Whereas K-12 teachers desire easily searchable, clearly segmented film chapters associated to specific competencies, most film publishers lack the resources to meet these needs. What to do when your product lacks the necessary add-ons for classroom use? Luckily, EdGate’s dedicated films team has you covered with our robust films services. 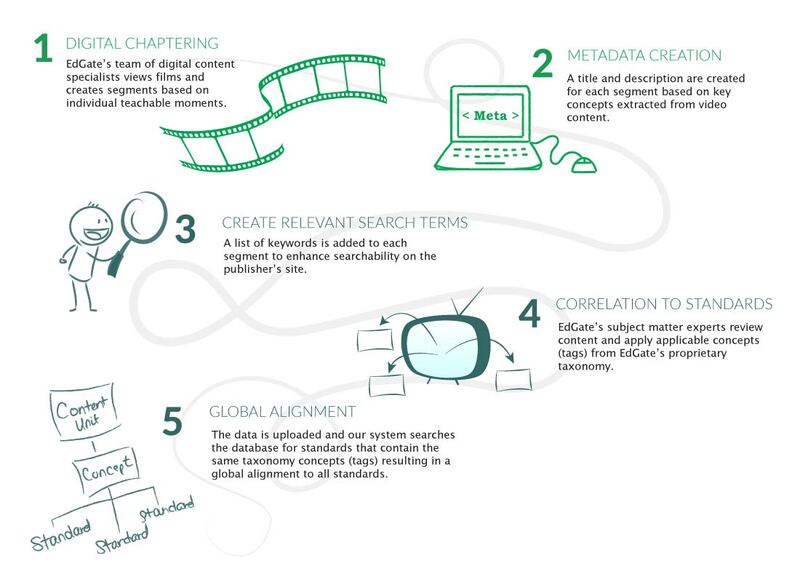 Our group of subject-matter experts and suite of automated tools can make your film content more useful for teachers with our digital chaptering, metadata creation, keyword creation, and global alignment to our repository of 5 million+ standards. If you’re looking to make your product more competitive for an educational audience, look no further than EdGate Correlation Services. For over twenty years EdGate has served publishers in their quest to make their educational films classroom-ready. To learn more about EdGate, our services, and partners, please contact us and one of our Account Executives will be happy to schedule an appointment with you.